The past few weeks I have been trying to eat a lot healthier. I have also been going to the gym, and it feels great. But every now and then, you gotta indulge. Sometimes, you need to stop counting calories, and just enjoy something really decadent. Treat yo self, ya know? Speaking of the gym, why is it so dang hard to go? I always enjoy it when I'm there, and I feel great it's over, but I really drag my feet when it comes to getting in that building. What helps motivate you to go to the gym? Wait, back to treating yourself! 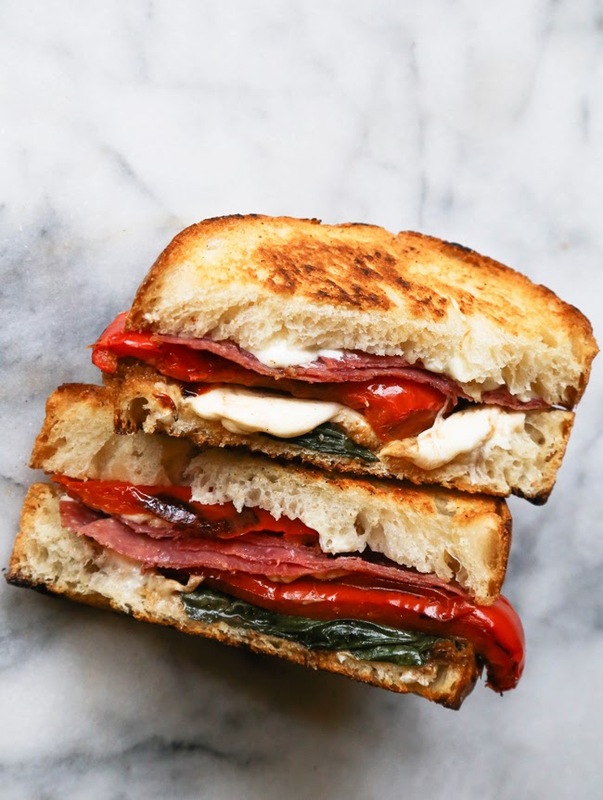 If you like caprese anything, this sandwich is right up your alley. Instead of tomatoes, roasted red peppers fill in, adding extra kick and a bit of spice. 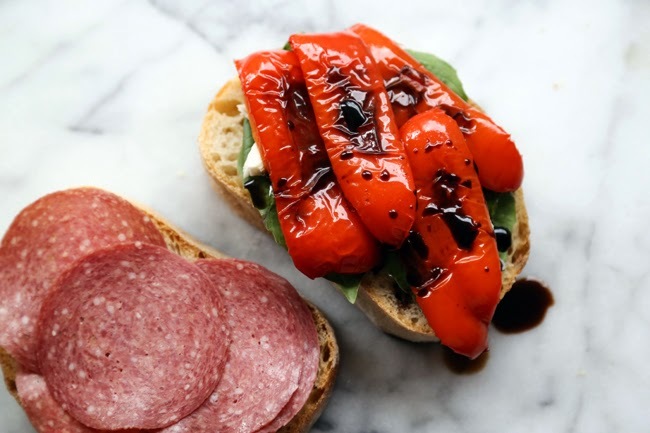 The salami adds a bit of salty goodness. 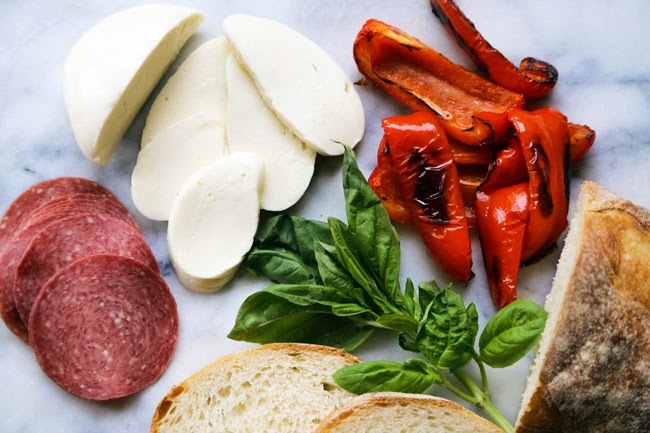 Also, freshh mozzarella...enough said. 1. First, roast your peppers! Heat oven to 400 degrees. Cut the pepper in half, remove all the seeds and stem, then slice the pepper into 4-5 slices. Place peppers in a baking pan, drizzle with olive oil and let roast for about 30-45 minutes until peppers are soft. 2. Once the peppers are done, remove from the oven and set aside. Slice two pieces of bread, and turn your skillet on to medium heat. 3. 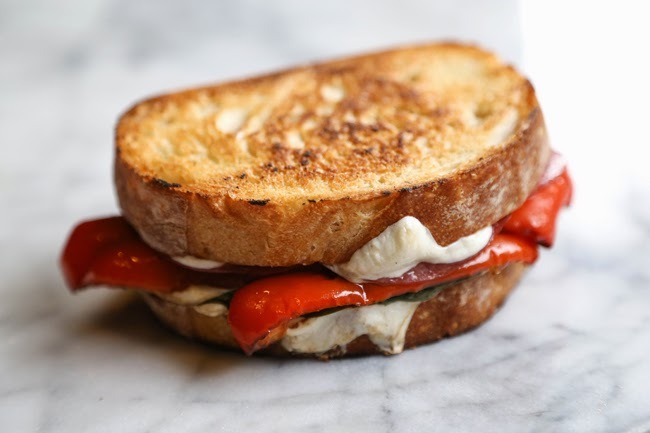 Layer mozzarella, fresh basil, a little more cheese and roasted red peppers on a slice of bread. Drizzle red peppers with a bit of balsamic vinegar. 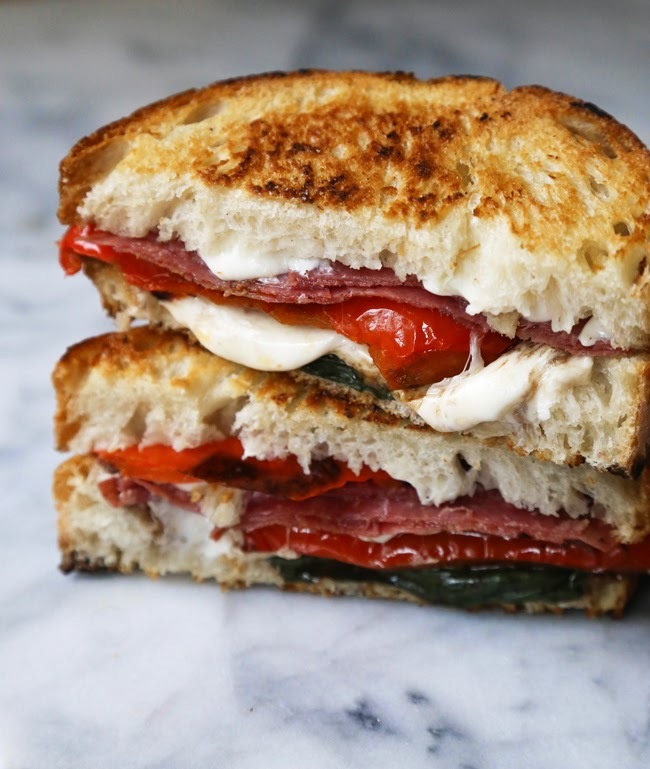 Top with salami, and add more cheese. Top with the second slice of bread, and place the sandwich on the skillet. 4. Let both sides of the sandwich cook until bread is golden brown. Turn the heat to low, cover and let cook for a few minutes until the cheese is melted. 5. Remove from skillet, cut in half and enjoy!